There's a dizzying variety of great phones on the market. These aren't them. Alibaba Profit Surges, but a Revenue Gain of 40% Still Misses Forecasts - NYTimes.com: "Just a day after a surprisingly blunt exchange with a Chinese regulator that unnerved investors, the e-commerce giant Alibaba Group on Thursday reported a 40 percent revenue increase in its final quarter of 2014, though the total was weaker than expected. The company counted brisk sales during the Singles’ Day e-commerce holiday in November in China, but it is facing an economic slowdown in the country and overall sales did not match the high expectations of analysts. Worsening matters for Alibaba, which raised $25 billion in an initial public offering last year, the run-in with China’s main corporate regulator over the sale of fake goods is prompting concerns from investors...."
Estimize CEO Leigh Drogen, JMP Securities' Mark Lehmann and Bloomberg's Cory Johnson and Scarlet Fu react to Apple's fiscal first-quarter profit. They speak with Bloomberg's Trish Regan on "Street Smart." 2. Find "Enable Enhanced Bookmarks" and disable it (old bookmarks function will return after you close and relaunch chrome browser). Chrome users attack new graphical bookmarks manager | Computerworld: "... user feedback in a message posted to the Chrome support discussion forum. Although there were a few users who applauded the redesign there, most did not, labeling it "an abomination," "unmitigated disaster" and "child-like." Those who roasted the new manager asked Google to restore the old list view or at least offer it as an option. Those with large numbers of bookmarks were particularly frustrated with the change. "The new bookmark manager is unusable if you have more than a handful of bookmarks," said a user..."
Would you sign up for a Google wireless plan over Verizon or AT&T? Through an agreement with T-Mobile and Sprint, Google is on its way to becoming the newest wireless carrier in the US, according to reports. British Fraud Office Ends HP-Autonomy Inquiry - NYTimes.com Jan 19, 2015: "... After reviewing the Autonomy sale, the British authorities said on Monday that they would end their investigation, though a similar inquiry by the American authorities into potential accounting abuses would continue. “In respect of some aspects of the allegations, the S.F.O. has concluded that, on the information available to it, there is insufficient evidence for a realistic prospect of conviction,” the British authorities said in a statement on Monday." Jan 8, 2013 ".... "According to a recent report in Fortune, HP CFO Kathie Lesjak tried to stop HP from buying Autonomy for nearly $12 billion ... thinking the price was too high, but she lost that battle to then-CEO Leo Apotheker." Léo Apotheker - Wikipedia:: "Leo Apotheker is a German business executive. 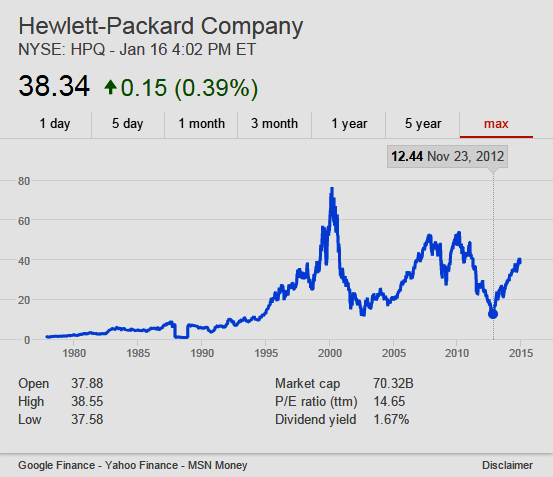 He served briefly as the chief executive officer of Hewlett-Packard from November 2010 until his firing in September 2011. He also served as co-chief executive officer of SAP from April 2008 until he resigned in February 2010 following a decision by that company to not renew his contract. During his tenure as chief executive at HP, the company lost more than $30 billion in market capitalization after a series of strategic missteps by the company, leading to his resignation...."
China's Xiaomi takes aim at Apple with new phone: "...The Chinese manufacturer known for ultra-low-priced handsets on Thursday unveiled a new model that Chairman Jun Lei said is comparable to Apple's iPhone 6 but thinner, lighter and much cheaper. The phone starts at 2,299 yuan ($375), less than half the 5,288 yuan ($865) price of an iPhone 6 in China...."
Shazam - Wikipedia: "Shazam is an app for smartphones, PCs and Macs, which is best known for its music identification capabilities. Shazam Entertainment Limited was founded in 1999 by Chris Barton, Philip Inghelbrecht, Avery Wang and Dhiraj Mukherjee. The company is best known for its music identification technology, but has expanded to integrations with cinema, advertising, TV and retail environments. Shazam uses a smartphone or Mac's built-in microphone to gather a brief sample of audio being played. It creates an acoustic fingerprint based on the sample, and compares it against a central database for a match. If it finds a match, it sends information such as the artist, song title, and album back to the user..."
M&A Activity: Will Mega Deals Continue in 2015? PricewaterhouseCoopers Head of U.S. Capital Markets Neil Dhar discusses mergers and acquisitions and regulatory hurdles. Deals in 2014: Why $800B Is Still Pending - Comcast deal dead? As we get ready to enter the new year, there are still $800 billion in corporate mergers and acquisitions that aren’t done yet. As Comcast merger enters final phase, deal may be on thin ice — "...“What makes Comcast unique is its power in three different facets — as a programmer, a distributor and an ISP.” Earlier this year, Comcast demanded that Netflix pay tolls to prevent its internet stream from being degraded. In the future, critics fear, a merger would make it easier for Comcast to exercise the same sort of control over a wide range of other over-the-top internet services, including a standalone HBO. Comcast could one day control online entertainment options in the same way that it currently controls TV channels. Such fears have led merger opponents to say the FCC or the Justice Department should step in not because of cable TV concentration, but to ensure that Comcast can’t monopolize broadband-based content...."
Which Tech Startups Are Going Public in 2015?